Blast Rooms Built For Visibility and Speed. Whe ther you are refinishing hand rails or making those rusted parts good as new, you’ll need a way to remove existing defects before applying any powder. Parts covered in old paint, rust, or scaling won’t hold the powder, and after curing, will have a brittle finish that flakes and falls off. Avoid costly reworks. Reliant Finishing Systems provides a complete line of blast rooms and custom enclosures designed to safely remove any unwanted particulate quickly and efficiently, all while being a fraction of the cost of other blast room solutions. Blasting is a key component to getting the best finish for your customers. From metal scaling to rust, blasting can help remove surface problems and give you a clean surface for powder coating adhesion. If repainting or refinishing is a large part of your business, blasting is necessary to remove any existing paint or previous coating. Found a problem in your production line and produced a bad batch? Don’t throw out good parts. Blast the poor coating off and start again. For more information about blasting and other pretreatment options, please see our further articles: Cleaning and Pretreatment Primer and Getting The Right Blast Room. Blasting is something every new or existing coater should consider when installing or expanding their capabilities. Reliant Finishing Systems makes it easy to add a high-quality enclosure specifically designed for powder coating right to your new or existing line. Call one of our systems specialists today to ask about how easy it is to add blasting to your operation. Our blast rooms and enclosures are some of the highest quality in the entire industry. Check out a few features below, and feel free to browse our entire line of powder coating tools and supplies. True, HEPA filtration is available on most models. 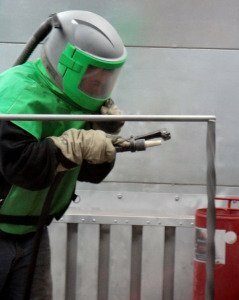 If you have any questions about blasting, blast rooms or other pretreatment options for powder coating, feel free to browse our News section or give us a call. Our systems specialists will be happy to assist you.